Absorbed with cars every single day! Hello, my name is Masato Kawabata and my passion for automobiles extends all the way down to the roots! Today, I would like to talk about my life in terms of drifting. First off, the public may assume that all D1 drivers love cars and is absorbed in it every single day. In my case, yes it's true! I am often around cars at GP Sports, where I help develop new products and test drive vehicles. I'm usually around cars from four to six hours at a time. Oh, and the other day, I had to deliver a used RX-7 that a customer had bought from our shop to Tokyo. When I arrived, the customer recognized me right away. Personally, I was very happy and surprised that someone who lives so far away had recognized me! I can say that that is one of the great aspects that make my work worthwhile. I started reading Option magazine as early as 4th grade. Thinking back, I thought it was maybe a little too early. Back then, Option featured many articles on drag racing and top speed runs which made many kids yearn to be a racer. In junior high, I was acquainted with Video Option, which first introduced me to the sport of drifting. But at the time, no matter how much I loved cars and drifting, it didn't mean that I could drive one. So the next best thing I thought of was to ride my bike to the local mountains to see first hand what drifting was like. My infatuation for drifting kept increasing at that point, so then I persuaded my parents to take me to Mizunami Motorland to go learn more about this sport. There, I witnessed some amazing drifting, with plenty of intensity. When I finally reached high school, I was still unable to get a motor vehicle license, so I decided to get a motorcycle. There I found a part time job at a bike shop and got used to assembling and disassembling engines. Stroking 50cc engines to 60cc and port and polishing heads were my daily routines. I continued my quest to satisfy my crave for drifting by watching Option Videos and reading books written by the Drift King, Keiichi Tsuchiya. Video games acted as a driving simulator for me and drifting was all I can think about at the time. On the senior year of my high school, I got my drivers license and quickly purchased an 180SX! I was so happy that every single day, I practiced the techniques I learned from the Drift King's book such as heel and toe and proper weight transfer. 3 months after getting my license and practicing everyday, I finally decided to hit the race track. That fist day, I was surprised to see that I was able to connect all my drifts in one lap. I began to hang out with the D1 driver Kuroi, which he started to give me lots of advice and show me different techniques. When I was 19, I went to my first drifting competition with him, and to everyone's surprise, I ended up winning that event! Time flew by and when I was 21, I was scouted at one of the events by the president of GP Sports. There, he proceeded to sponsor me with body kits and as I kept entering drift competitions, I was slowly transforming into a semi-pro status. In 2003 when I had turned 23, GP Sports had asked me the magical question “You wanna come work for us?” which I quickly approved and moved from Osaka to Niigata. Currently, I still work at GP Sports while competing in the D1 Grand Prix with TRUST as my other sponsor. As a D1 driver, I noticed that my drifting style had transformed immensely compared to before. In the past, I used to drift my slammed gold 180SX trying to look as flamboyant as possible and my main concern was just to have fun. The race track I frequented was the Meihan Circuit where I aggressively drove and experienced many crashes! So like I stated before, my driving style had greatly changed when I started to get involved in D1. It's a win or lose situation once the competition starts and unlike my amateur days, you really have to start thinking about how to win. With a huge sponsor like TRUST on my back, there is a lot of pressure as well. The only reason I can keep moving forward is my strive and will to stay with the top level drifters of the world. When I was a kid, my parents had taken to me to a place with a spectacular scenery on their day off. Therefore I started taking my family to places with great landscapes on my days off. I would take them to go to spa resorts, shopping, and many other places to have fun as a family. Will strive to keep appealing my best! The most memorable time I've had in my career so far is the 2005 D1 round 6 and also taking 1st at the Fuji round. The semi-final battle with Suenaga in the RX-7 was a one that ill never forget. We both brought out our best techniques and fully attempted to destroy each other. I'm sure the intensity of that battle was experienced through the spectators as well. Although I had lost that match, it shed a new light into my mentality. The feeling of giving it my all to battle someone was not the only thing that I gained from that match. I would really love to battle someone again under that kind of intensity. The last thing I would like to appeal is that although I may look like the shy, quiet type, I would like to make my self be known from this point on. I'm going to take things further than what I displayed before! 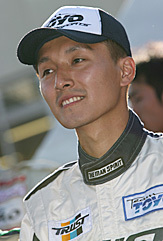 Kawabata's blue TRUST S15 premiered at the 4th round in the 2002 D1 Grand Prix. Kawabata refuses to give up his composure even resorting to go off course during battles. There, Mana-P the judge always says the famous line “that's not a part of the track Kawabata!”. 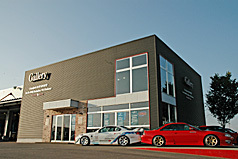 Kawabata works in the Niigata Prefecture at a shop called Gallery, one of GP Sports' antenna shop. There, he sells parts, test vehicles, and do various other things to make a living. As a D1 driver, he also participates in research and developing aftermarket automotive components. He was associated in the development of the G-Master SCV brake pads. 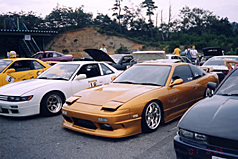 Though he currently holds an strong image of being the driver of the blue TRUST S15, Kawabata was known as the guy with the gold 180SX in the past. Kawabata is very picky when it comes to shoes made by Puma. He has various sets picked out for work use and for weekend use. He demands to use these race shoes as well. “I don't know why but I've always loved these shoes.” States Kawabata.